I'm doing an experiment and i'd like people to submit a string of 500 numbers typed using only the row above QWERTYUIOP (or whatever it is on your keyboard). If you are interested, please attempt to type EXACTLY 500 digits, with no miscellaneous signs such as `, -, and +. If you DO accidentally include these symbols, instead of manually replacing them with a number of your choice please DELETE them and instead type further random digits at the end and then trim down to exactly 500. Please try to make the numbers randomly- they do not actually have to be random, just be random to you. You cannot use random number tables or the like. Enter the 500 numbers here, and please post the result given in this thread (the numbers themselves are not good enough- please use the popup i linked to because it will save me a lot of work). Top row of keyz only? And I SO wanted to type 'Kimb' 125 times!! Good job, apenpaap, the forum looks much nicer now. CLARIFICATION: The numbers must be entered by you hitting numbers keys that seem *random* to you. Of course, they won't actually be random, but I'd like a series of digits you'd make if asked to provide digits that seemed random, off the top of your fingertips. For example, you could just smash "random" keys with your fingers to provide the digits. There still must be 500 digits entered. Also, I became so curious as to what would happen with your guys' numbers that I programmed a script that will do all the work for me- please click here for a popup to enter your 500 numbers. It will give you a copyable text that gives the distribution for your numbers and for their first differences. Please post this text either *instead* of your numbers or alongside them- just the numbers is now inefficient now that I have this piece of work helping me. For example, for a larger sample of 1000 numbers the script returns "The distribution of numbers is <array> and the distribution of differences is <array>. You entered a total of 1000 numbers." "The distribution of numbers is 120,140,126,76,53,129,95,75,81,105 and the distribution of differences is 8,13,31,47,72,61,71,73,125,6,132,99,52,49,51,28,23,21,37. You entered a total of 1000 numbers." As you can see, my "random" numbers are not so random after all: I almost never repeated the same digit twice in a row. As for entering 500 random numbers, the problem there is that it's quite a lot of work. With my 500 fives, I could just type ten fives, copy them ten times, and then copy the whole thing five times. But to actually type 500 random numbers is a lot of work on its own, and then making sure it's not 499 or 501 random numbers seems like a total pain. So Gondor, do you care or are you in some way testing for the difference between typing numbers using the line above QWERTY vs. using the numpad? I would imagine there would be differences in the (non)randomness between the two methods, unless the subject is actually thinking of the numbers before typing them. I am not testing the differences between using the number row and numpad so much as I am testing both methods against computer-generated random numbers. The distribution of numbers is 37,56,53,22,64,84,46,54,55,28 and the distribution of differences is 2,4,9,15,29,25,27,53,67,47,55,57,17,30,29,12,10,8,2. You entered a total of 499 numbers. The 499 is (apparently?) just a fluke since I was just mashing the numpad as randomly as possible for a while without actually counting. If having exactly 500 is very important then I would suggest including a counter to help the user keep track of how many digits they've entered. These are your first differences. They show a distribution that resembles mine except in one important aspect: You have a far less conspicuous lack of repeating digits. There appears to be a lack of differences of 3 and -3, which might be explained by the way you typed the numbers. 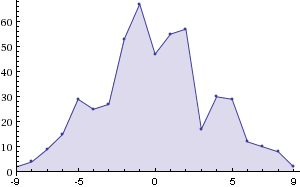 A perfectly random distribution of an infinite number of digits will have a probability of any difference of 0.1-0.01*abs(x) for integer x between -9 and 9; in other words, probability 0.1 that the difference between two adjacent digits is 0, probability 0.09 that the difference is 1 or -1, etc. So comparisons of your distribution against the expected for random digits is a comparison to an isosceles upright triangle with height 0.1*number of digits and base of length 20 centered on 0. How did you type your numbers anyway? By the way, I have uploaded the program so that it now asks you to enter so many more numbers if you enter too few. If you enter too many it will trim your submission, and if you still have too few after submitting more it will ask again for more numbers with an updated request. If you want to terminate the requests, which will keep popping up if you keep entering too few numbers, confirm either an empty box or a box containing at least one `, -, or +. The distribution of numbers is 82,27,32,52,32, 70,45,88,46,26 and the distribution of differences is 1,2,16,18, 42,32,36,49,55, 7,55,66,21,20, 27,12,19,17,4. You entered a total of 500 numbers. What is this in aid of? Are you stealing our souls? I entered my numbers by a semi-controlled mashing of the numerical keypad with the intent of trying to be randomized. It occurred to me at the time that repeating digits should be fairly common in a random string of numbers, but is surprisingly rare to do if you're just mashing keys. So I deliberately made repeated keystrokes from time to time to try to account for that, thus the reduced lack of differences of zero. The lack of differences around three is interesting. I suspect it is a result of how I was using the numpad, since the average difference between adjacent rows is 3. I must have been more frequently making consecutive keystrokes that were separated by two rows (e.g top row [7, 8, or 9] followed by bottom row [1, 2, or 3] instead of following with middle row [4, 5, or 6]). 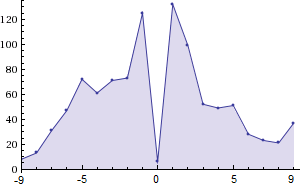 This explanation seems consistent with the strange double peaks around +/- 4 and 5 (but why not 6? ), and a similar idea probably also explains the lack of differences of 1 and 2, (fewer consecutive keystrokes within the same row). This is pretty neat stuff to look at. Entering truly random numbers by a human is hard!